Seen in the mega disappointing Botanical garden in Mauritius. Err they forgot to label 98% of the trees. This caught my eye because of the angle of the seed pods...see pic 4. A helpful expert has suggested sausage tree but the leaves on this were simple not pinnate so I ruled it out. Hey, I got one! Swartzia. I looked up fabaceae longest leaf petioles, and found a drawing. I will leave the species to you to figure out. I have never seen one of these. Thanks for trying to help....appreciated. Need to check this suggestion out. Surely it is the flowering parts with the long petioles. It is the claw like 90 degree bend I find interesting...see pic 4. I sent an e mail to SSR Botanical garden for this one...just got a reply. Refer to the mail below regarding the above subject. Submitted for your kind information. I wish we had seen the flowers it looks gorgeous. Wow, not even Fabaceae. Your photos show pulvini at the base of the leaf petioles, a feature of fabaceae, and the first several photos of Steriphoma I saw do not seem to show that, but I switched to google and am getting more convinced by a few other photos. I'm glad you were able to post a reply. 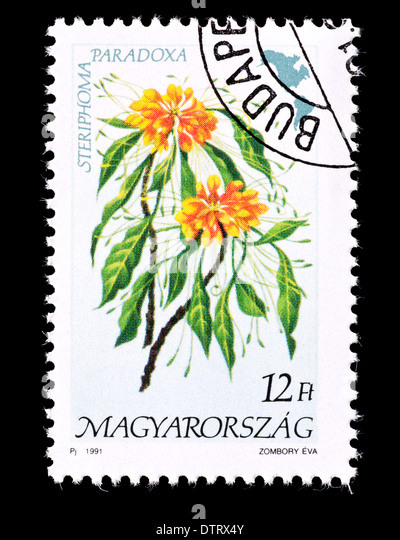 Hungary even has it on a stamp, calls it an American wildflower. 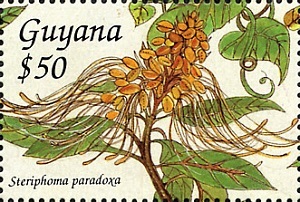 Guyana does too, but characteristic details are missing. How odd that Hungary features it on a stamp. Silver surfer and wcutler like this.